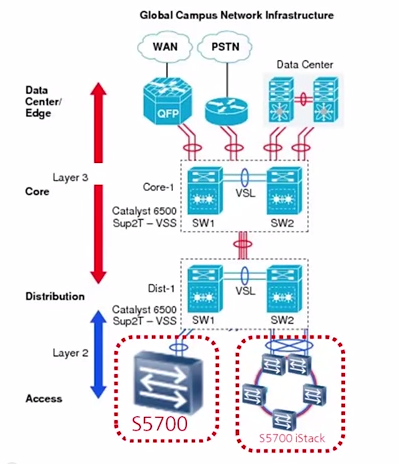 What’s the role of Huawei S5700 Series in a network? In brief, the S5700 series gigabit enterprise switches (S5700 for short) are next-generation energy-saving switches developed by Huawei to meet the demand for high-bandwidth access and Ethernet multi-service aggregation. The S5700 is for use in various enterprise network scenarios. For example, it can function as an access or aggregation switch on a campus network, a gigabit access switch in an Internet data center (IDC), or a desktop switch to provide 1000 Mbit/s access for terminals. It is available in a limited version (LI), a standard version (SI), an enhanced version (EI), and an advanced version (HI).